On paper, the Mazda CX-3 is inferior to the Mazda3 in every way except ride height, but it’s still a cool little CUV. What do you need to know before you buy a Mazda CX-3? Don’t worry, we’ll tell you everything right here in the Ultimate Buyer’s Guide. If we’re completely honest, crossovers don’t make all that much sense. They’re essentially small wagons on big wheels, usually with some sort of AWD system tacked on. Lacking the greater flexibility and practicality of a full SUV or the frugality/utility of a normal hatchback or wagon, they remain a strange, indecisive choice. They’re also the fastest-growing and most popular class of car by far, if you want to read anything into that. The Mazda CX-3 is a crossover, and, despite everything we just said... we still like it. You’d be forgiven for thinking that the CX-3 is based on the Mazda3 platform, what with those common 3s and all, but it’s not. It’s actually based on the smaller Mazda2, though this is fairly well hidden under a genuinely stylish and attractive body. The exterior design may be the CX-3's biggest strength among the other crossovers–it’s a genuinely good-looking vehicle. Unlike most crossovers that feel a bit like bloated hatchbacks wearing big shoes, the large wheel size ratio to the overall size of the car works well here, giving the car a look sort of reminiscent of those art school car renders we always see, and always know the actual car will never look like. But, somehow, this one manages to retain that feel. There’s a really novel undulating character line down the side flanks of the car, the tapered greenhouse is striking, and there’s some nice detailing, especially in the interconnected relationship between the headlights and grille. The CX-3 looks sophisticated and modern. The tradeoff here is that, revealing its Mazda2 origins, it’s pretty cramped inside. It’s not a huge car on the outside, but it’s not tiny, either. The inside, though, feels like all the open volume has been laboriously hacked out of thick, solid stuff. It’s all well-appointed and looks and feels quite good, there’s just less usable volume than you’d think. The back seat headroom is more limited than you’d expect, and the cargo area is just a little too small in pretty much every dimension. If the inside was food at a restaurant, you’d enjoy it, but spend the ride home bitching about the portions being too small. Mechanically, the Mazda CX-3 shares Mazda’s 2-liter Skyactiv-G inline 4 with the Mazda3, making 146 HP. That’s not a number worthy of any sort of spit-take, but it gets the CX-3 to 60 in about 8 seconds, and the car doesn’t feel sluggish. For a big-wheeled, relatively high-sitting CUV, it handles with precision and balance. It’s pretty fun to drive, overall. Fuel economy is decent too, with about 28 in the city and mid-30s on the highway. It’s comfortable on long highway drives and can actually be rewarding on more fun roads. That’s a pretty rare thing in a crossover, so Mazda’s chassis tuning witch doctors should get an extra helping of Chassis Tuner Chow or whatever it is they like. The infotainment system’s interface is pretty clunky, and the CX-3 has Mazda’s insipid volume/other stuff rotary knob situated between the front seats, roughly where Saabs used to stick their emission key. Having the volume knob anywhere other than in the center-leftish area of the dash is a mistake. Muscle memory made me crank up the heat nearly every time I wanted to crank up the music. Those two results are not interchangeable. Mazda showed the world its 2016 CX-3 crossover at the 2014 Los Angeles Auto Show. It’s their fifth application of their fuel-saving SKYACTIVE technology and KODO design language and is built on the tiny Mazda2 platform. Of course, the CX-3 is much larger than the 2, with an extra 8.5 inches of length and about three inches of extra width. Compared to the Mazda3 hatchback, the wheelbase is five inches shorter and overall length is about a foot less, though curb weight is similar between the two. Mazda is appealing to youngsters with the CX-3, putting a big screen on top of the dashboard and offering a rotary knob to control the infotainment system. Of course, since driver assist features are all the rage, Mazda offers i-Activesense with lane departure warning, radar cruise control with collision warning, high beam control, rain-sensing wipers and other We’ll Do It For You features that help you turn off your brain while driving. The Mazda CX-3 uses the same SKYACTIVE-G 2.0-liter direct-injected inline-four found in the larger CX-5 crossover and the Mazda3 small sedan/hatch. Except, the CX-3 application, the engine puts out nine fewer horsepower and 2.85 fewer nurples of torque (four lb-ft). That engine routes power to either the front or all wheels via a six-speed automatic transmission. You can expect this powertrain to get the 2,900 pound CUV to 60 MPH in about eight or nine seconds. So it’s not particularly powerful, and you don’t get a manual transmission, but for most compact CUV buyers, it’s probably fine. Fuel economy is decent for the class, but not spectacular considering the car’s feathery curb weight and small powertrain. Highway mileage is so-so, matched by vehicles with more weight and much more horsepower. But the low 2,900 pound curb weight makes for very good city mileage in the upper 20s. 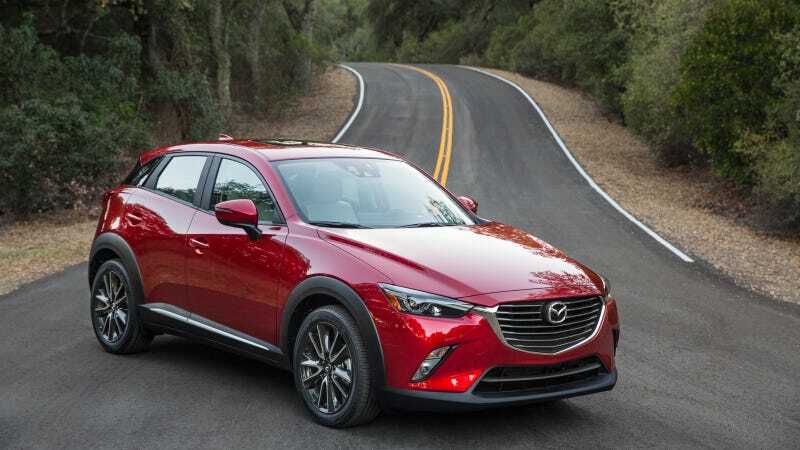 Regardless of which trim you choose, the CX-3 will return close to 30 MPG combined, so if you really want to pass up the Mazda3 because you think you need the CX-3’s ride height, you won’t be hurting too badly at the fuel pump. The Mazda CX-3 is available as a Sport, Touring or Grand Touring model, all of which can be optioned with all-wheel drive. Steering for all CX-3s is electric and suspension is a MacPherson Strut design up front and a torsion beam setup in the back. Brakes are 11.6-inch vented discs up front and 11.1-inch solid rotors in the back. Touring: Starts at $21,960. Notable standard features over Sport: Mazda Advanced keyless entry, body-colored side mirrors, heated mirrors, heated front seats, blind spot monitoring, Rear Cross Traffic Alert, front armrest, overhead console, leatherette-trimmed seats, leather wrapped steering wheel and shift knob. Notable options: Premium Package: power moonroof, Bose seven-speaker audio system, HD radio, Satellite radio ($1,410); otherwise similar options as Sport. Grand Touring: Starts at $24,990. Notable standard features over Touring: 18-inch alloy wheels, power sliding glass moonroof, paddle shifters, automatic climate control, leather-trimmed seats, head-up display, navigation, Bose seven-speaker audio system, HD radio, satellite radio, LED headlights with auto leveling, Adaptive Front-lighting System, LED taillights, LED fog lights, Tonneau cover. Notable options: I-ACTIVESENSE Package: Radar cruise control with close proximity warning, Smart City Brake Support system, Smart Brake Support system with Collision Warning, Lane Departure Warning, high beam control, Distance Recognition Support, automatic on/off headlights, rain-sensing wipers ($1,920); otherwise similar options as Sport. I think for overall practicality and enjoyment the Mazda3 is a smarter choice, but there are actual reasons to buy the CX-3: the looks, the handling, maybe you really do need some sort of AWD setup, and maybe you have a bigger-tire fetish of some kind. If you do want one, they’re reasonably priced, starting at just over $21,000 for the AWD one. You can save a few grand going for the FWD one, but if you do that, you may as well go for a Mazda3. In this case, I think the best value package might be the Touring, but about $3000 more gets you to the Grand Touring, which, at $26,2400, includes a nav system, satellite radio, leather, and a fun little fighter-jet-style heads up display that flips up when you start the car for a fun bit of silly drama. If you have the cash, it’s worth the jump. Get it in red or blue; you lose too much of the contrast and look with black, and the greys and silvers are boring (except for the Meteor Grey).